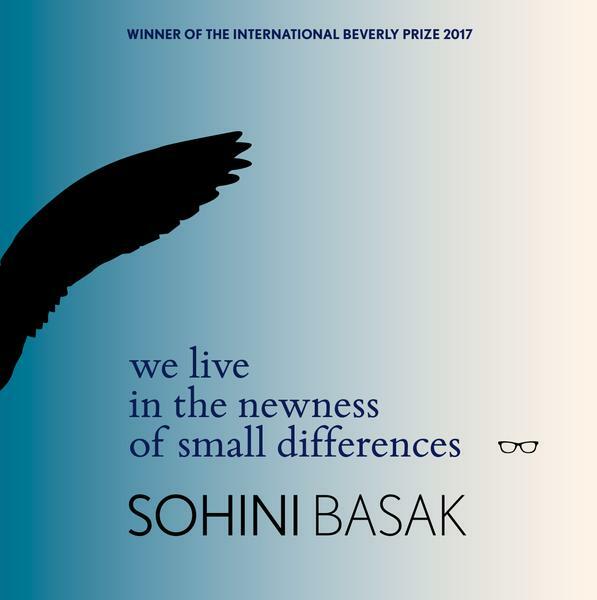 I found common ground with the speaker in Sohini Basak’s poetry only a handful of poems into We Live in the Newness of Small Differences (Eyewear, 2018), her prize-winning debut collection. In ‘What We Can’t Distill’, she writes of ‘[s]tudying Pather Panchali with father’; I recalled, upon reading the line, watching Ray (in our case, Goopy Gyne Bagha Byne) with my own father, listening to him expound upon the virtues of the Apu Trilogy, which he promised we’d watch together when I was older. Basak is consistently interested in the act of remembering and reminding in her poetry; and although she is calling upon her own memories and the shared memory of her family, and, in the second person, upon people she knows or may have known to remember with her, I am certain that I am not the only reader who will have found memories that look like my own in her plangent cataloguing of the specifics of the shared everyday (although I had the advantage of our shared linguistic heritage when reading poems like ‘Why Did You Stop Writing’, where she writes in Bengali script). Like Ray, Basak is mining, from the small and closely seen, a wide-ranging empathy for the ecosystems she shares with multifarious life, the overwhelming ‘number of lungs / that need to breathe’. One after another, four poems in the book’s first quarter ascribe a largeness of intent to and effect of the insects sharing her space: ant armies, each ‘carrying a planet’; wasps that ‘can bring down aeroplanes’; silverfish that ‘make[s] living palpable in starch’; termites that hollow out furniture and then, on being detected, ‘escape into the nuptial rain’. It is a love she has inherited from her grandmother; in one of my favourite poems, ‘Poraghati’, she recounts the latter’s life as a young girl in the titular village. (Once again, I was struck by the similarity of a detail of familial narrative to trivia from my own history; the origins of our village’s name, too, has been a matter of extended debate. In our case, Turkish invaders take the place of stairs leading to water.) Basak is especially vivid in these poems of familial history. ‘Why Did You Stop Writing’ fashions lines from her father’s poetry (transcribed in Bengali script) into an urgent, loving sort of interrogation. Basak attempts to match her venturesome love for the living and the once-alive with adventures in form, some of them fairly self-conscious. Basak varies the shape of her poems, playing with space and indentation as if to demand an eye like hers, unplacid and questioning, of her reader. But I preferred the focused music of prose poems like ‘Your Succulents Need A Drought’, their hypnotic storytelling undisturbed by stanza breaks. The displacement of formal tradition is least tentative and most successful in ‘And Other Stories’, the section that closes out the book with a set of poems titled with bird names in Bengali. The best work here (‘Babui’ is a standout) often vibrates with the strangeness of myth and asks for a surrender to its solemn iteration of play. Sal Salam is of Bangladeshi and Indian heritage and lives in Chicago. She works in HIV Testing and Prevention Counseling and writes about cinema on occasion. She is passionate about creating and holding space for queer and trans people of color. Sal can be found at @salandthebadpun on Twitter.